Afghanistan had a network of public libraries in major cities until the early 1990s. While efforts are now being made to restore infrastructure and collections across the country, quality remains patchy and access very limited. Although earlier rulers are believed to have maintained collections of manuscripts, the first ‘royal library’ was established in 1901 by Amir Habibullah Khan, who in 1919 housed his collection in the Bagh-e-Bala Pavilion. In 1924 this library, together with the king's small ‘museum’ collection, were re-located to Koti Bagcha, a pavilion within the Arg-e-Kabul, Kabul, where they were formally inaugurated as the National Museum. In 1931, both the museum and its library were again re-located to a building in Darulaman, which was originally built as a municipal office. The museum has remained in this building ever since. With the founding of the University of Kabul in 1931, academic material was transferred and collected in the University of Kabul Central Library, which today remains one of the region's leading academic libraries. In 1939, a separate library of Afghan publications was established, and a number of important historical documents and manuscripts from the National Museum were transferred to it. In 1957 the Kabul Public Library was founded, giving Afghanistan its first public library. Branch libraries were subsequently set up elsewhere in the country - in Herat in 1960; in Balkh, Faryab (Andkhoi and Maymana), Jowzjan, Khost, Nangarhar and Paktia (Gardez and Sayed Karam) in 1966; in Badakshan and Farah in 1967; in Samangan (Aibak and Marzaki) and Takhar in 1972; and in Badghis, Bamiyan, Ghor, Kandahar, Kunar, Kunduz, Laghman and Logar (Pul-e-Alam and Baraki Barak) in 1973. Provincial public libraries were subsequently established in Kapisa and Zabul in 1976; in Nimruz and Samangan (Tashqurghan) in 1977; in Sar-e-Pol in 1978; in Wardak in 1980; in Parwan (Charikar and Jabul Saraj) in 1985; in Kunar in 1988; in Paktika in 1989; and in Helmand in 1990. An Afghanistan Library Association was set up in 1971, to promote literacy and the development of a national library system and a school of library science, as well as to protect the interests of Afghan librarians. The Association published (irregularly) the Afghan National Bibliography. In 1973, as awareness grew of the need for specialist attention for certain historic material that had until then been stored in the Kabul Public Library, the National Archives was established as a specialised institution responsible for the collection and preservation of historic documents and manuscripts. In the 1970s, the population of the principal urban centres in Afghanistan had a well-established culture of library usage, with public libraries serving not only as repositories for books, but also hubs of community life. However, after 1979 many libraries were closed, and during the subsequent civil conflict a number of provincial libraries were looted by factional fighters. 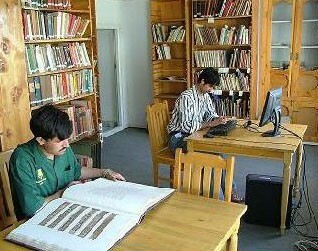 Little development in the field of libraries took place during the Taliban administration, between 1996-2001. Since 2001 the Ministry of Information and Culture’s Department of Public Libraries has engaged in rebuilding the public library infrastructure in Afghanistan. Fortunately, the Kabul Public Library seems to have suffered relatively little looting during the conflict of 1993-4, and its collection remained largely intact. Between 2001 and 2006 all 32 provincial public libraries were reportedly reopened, along with the inauguration of new libraries in Ghazni (2001), Daykundi (2004), and Nuristan, Parwan (Siya Gerd) and Panjshir (2006). Nonetheless, with the exception of Kabul, Herat, Mazar-e-Sharif (Balkh) and a few eastern provinces, library provision in Afghanistan remains poor, with very few suitable books available to the public and donations hindered by the poor security situation. University libraries also suffered badly during the 1990s, but whilst those in Kabul, Herat and Mazar-e-Sharif have since received donations of modern text books in English and in local languages, universities in other less secure regions have yet to rebuild their collections. Since 2001 the Délégation archéologique Française en Afghanistan (DAFA) Library, the Afghan Institute of Archaeology Library and the Academy of Sciences Library have reopened and two new research libraries have been established. The Afghanistan Centre at Kabul University (ACKU) makes available valuable Afghanistan collections assembled during the war years in neighbouring Pakistan, while the Afghanistan Research and Evaluation Unit (AREU) has taken over the former British Institute of Afghan Studies (BIAS) library of books and offprints pertaining to Afghanistan and the region. Both these libraries are now attempting to collect contemporary scholarship on Afghanistan. One of the biggest problems facing the Afghan library sector is the serious shortage of teaching and research material in Pashtu. This problem predates the civil conflicts of the 1990s - while strong in literature, Pashtu has always been less strong in technical materials, and although efforts are now being made to redress the situation, the Ministry of Information and Culture reports that for every eight new books in Dari only two new books can be acquired in Pashtu. Many book donations have been received from Iran, and technical books published in Farsi may now be found widely in many Afghan libraries, although there is debate about the content of some of this material, in terms of political and cultural history. Conservation is an ongoing issue, with Afghan librarians struggling to provide access for users, while at the same time protecting material from damage due to over-use, neglect and climate conditions. Another recurring problem is that of inappropriate donations, which are often made without consultation with local librarians, and result in piles of books lying unused on library shelves or stacked up in library storerooms and corridors. As in many developing countries, the priority for most Afghan librarians at this point in time is simply to be able to organise and manage books and documents efficiently and serve their clientele with a minimum of materials and technology. In the absence of any formal librarianship training programmes, this has been the core aim of the short training courses in librarianship offered in recent years through the auspices of the Afghanistan Research and Evaluation Unit (AREU) Library and the Afghanistan Centre at Kabul University (ACKU). Opened in 1957, Kabul Public Library was the first public library in Afghanistan. Its Director also heads the Ministry of Information and Culture’s Department of Public Libraries. Having survived the war with its building and collection relatively intact, Kabul Public Library currently has around 200,000 books, with around 50 per cent in Dari, 30 per cent in Pashtu and 20 per cent in English, plus smaller numbers of books in Russian, French and other languages. However, many of these materials are old and the collections need to be updated. In addition to its Lending and Reference Libraries, Kabul Public Library also incorporates a Children’s Section, an Afghanistan Section, a Literature Section and a Periodicals Section. The dedicated Afghanistan Section holds an important collection of over 500 books on Afghan culture and history, while the Literature Section stocks a reasonable collection of publications on Pashtu and Dari literature. The Periodicals Section holds a valuable collection of old newspapers, the oldest of which date back 140 years. Originally established in 1931 along with Kabul University itself, the University of Kabul Central Library was once one of the leading academic libraries in central Asia, with over one million books, research papers and manuscripts, including an important Afghan collection. Today the collection of the University Library is slowly being rebuilt, but there remains a shortage of books and other materials relevant to the programmes of study offered by the University. For research on Afghanistan the only surviving materials held by this library are copies of academic theses ('monographs') prepared by university staff and students. Originally established in Peshawar in 1989, the Afghanistan Centre at Kabul University (ACKU) was moved in 2006 to the University of Kabul, where it currently occupies temporary accommodation in the University of Kabul Central Library. ACKU holds a collection of around 25.0000 titles, covering subjects ranging from health, agriculture and economy to politics, arts and culture and including newspapers from the time of the mujahideen and the subsequent Taliban era. ACKU's aim is to share its information as widely as possible, in rural and urban communities, among government offices, among humanitarian aid agencies, with foreigners and with Afghans. It is one of the richest sources of information about Afghanistan in the region, and its collection has been described as 'Afghanistan’s single most valuable planning tool – our only user-friendly perspective on the key issues facing Afghanistan today.' The new purpose-built home for the Centre is currently under construction on the University campus and will incorporate a large reading room, a media centre, conference rooms and offices. Established in 2002, the Afghanistan Research and Evaluation Unit (AREU) exists to support the research and wider aims of AREU, to provide a public source of academic information on Afghanistan, and to offer technical advice and training to other libraries in Afghanistan on request. Its Afghanistan Research Newsletter also available online, is one of the most important sources of information on new research being undertaken on Afghanistan. Since 2003 the AREU Library has incorporated the former British Institute of Afghan Studies (BIAS) library of books and offprints pertaining to Afghanistan and the region. Recent acquisitions include Afghan government publications from all periods as well as donor and NGO materials published about Afghanistan, relevant publications from UN agencies, periodicals, maps, CDs and DVDs. The collection currently has more than 12,000 titles, primarily in English, Dari and Pashtu as well as in other languages (French, German, Italian and Russian). The Academy of Sciences Library dates back to the establishment of the Academy of Sciences in 1935, although the majority of its collection dates from the Soviet period (1979-1989). It functions to serve the needs of the Academy's three research divisions - Humanities, Natural Sciences and Islamic Studies. The Academy of Sciences Library claims to have the largest collection of Dari and Pashtu publications on Afghanistan covering the period from 1979-1989, comprising over 50,000 books and journal titles. A reading room is available, although foreign researchers are first required to obtain permission from the Ministry of Foreign Affairs. There is as yet no complete catalogue of the materials. The Délégation archéologique Française en Afghanistan (DAFA) Library was established in 1922 as part of the French archaeological mission in Afghanistan (DAFA) and continued functioning in support of DAFA's research activities until the organisation suspended its operations in 1982. Reopened in 2002, DAFA Library now once more provides administrative and logistical support to DAFA research activities as well as making its collection available by special permission to outside researchers. One of the most important centres of documentary research on the archaeology and history of Central Asia, DAFA Library covers Afghanistan, northern India, Iran, the Middle East and Central Asia. At its core is the original DAFA collection of over 10,000 books and 3,000 periodicals, supplemented by photographs, maps, plans and reports. Over the years, much of the library material in Afghanistan has deteriorated as a result of neglect, poor handling and over-use. In addition, many publications have been damaged or defaced by religious zealots. Since 2001, the repair of damaged items has been a priority for Afghan libraries, although the absence of specialist book and document conservation centres poses a problem for Afghan library staff, who have had to resort to primitive methods of conservation. There is an urgent need for practical training in the preservation of library materials through low-cost techniques that can be undertaken by the staff themselves, where appropriate. At the time of writing, no professional training courses in librarianship are offered in Afghanistan, and none of the staff working in Afghanistan’s libraries have benefited from training in librarianship abroad. Librarianship in Afghanistan is not considered a skilled profession; library staff all over the country are generally recruited from other fields and the focus during recruitment tends to be on the janitorial aspects of their duties. Staff also tend to be moved on after a very short time, and therefore do not have the chance to develop their skills. As in many developing countries, the priority for most Afghan librarians is to be able to organise and manage books and documents efficiently and serve users with a minimum of materials and technology. This has been the core aim of the short training courses offered in recent years through the auspices of the Afghanistan Research and Evaluation Unit (AREU) Library and the Afghanistan Centre at Kabul University (ACKU). In 2008 UNESCO sponsored AREU and ACKU to carry out a three-month training programme for university librarians, followed by a two-month training programme for librarians from the Ministry of Information and Culture, and finally by a third stage involving a survey of all provincial libraries and their needs. The Asia Foundation then gave funding for the training of provincial library staff in Herat, Mazar-e-Sharif and Jalalabad, both on-site and at AREU. Since that time AREU has conducted further training of government staff and staff from ACKU at the University of Kabul Central Library. Other small training sessions have been organised by the French Embassy, GTZ and the Goethe-Institut. The Ministry of Information and Culture's Department of Public Libraries is keen to identify international partnerships which will facilitate the development of further basic training programmes for Afghan librarians. Use the navigation bar on the right to make direct contact with organisations and individuals working in the libraries sector.